Cloud-First Security. A Platform Built in and for the Microsoft Azure Cloud. Cloud-first organizations are reaping enormous benefits from using Microsoft Azure for their critical applications and data. Agility, scalability, and easy user access are all at the heart of the cloud’s appeal. The downside is that with these benefits, IT security teams are forced to rethink their security and compliance strategy. Cloud apps and services offer the user more freedom, but they create huge blind spots for IT security. Yet, they’re still responsible for Azure security and compliance. The question for every IT security professional is how to extend your reach beyond on-premises security monitoring to Azure security monitoring without having to rely on different tools and monitoring approaches? AlienVault® USM Anywhere™ extends the reach of IT security beyond on-premises applications, data and user activity. Purpose-built for cloud security monitoring, USM Anywhere combines essential security capabilities to address Azure security concerns for risk reduction and improved compliance. What’s more - USM Anywhere provides single pane-of-glass visibility - whether your workloads are in Azure, AWS, on-premises on virtual machines (Hyper-V, VMware, etc.) - or all of the above. Moving your critical applications and workloads to the Azure cloud reaps a number of benefits for you and your business, but it can also expose you to new risks. As defined by the Microsoft Azure shared responsibility model, the cloud provider offers physical and infrastructure security as well as some basic network controls, but leaves the responsibility of application and data security to their customers. It’s up to Azure customers to detect and investigate security threats to their data, applications, and workloads. The challenge is that many traditional security monitoring approaches lack an understanding of the Azure environment, or how to take advantage of the unique aspects of the cloud. Thankfully, AlienVault USM Anywhere combines essential security capabilities such as asset discovery, vulnerability assessment, intrusion detection, behavioral monitoring, and SIEM into a single cloud-based, SaaS-delivered service built to effectively monitor the Azure cloud. What users are accessing Azure workloads? When? From where? Are attackers probing my Azure infrastructure? Has anyone compromised my credentials or workloads? Is there other activity (e.g. unusual system behavior) that could signal an attack? Compliance mandates like PCI DSS and NERC CIP require that you have implemented essential security controls to protect sensitive data in your environment, such as cardholder data or sensitive financial information. And of course, this remains a requirement regardless of where this data resides – on-premises in your physical data center, in the Azure cloud, or both. In order to pass your next audit, you’ll need to demonstrate that you know which Azure workloads contain “in scope” data, how that data is accessed, and whether there are known vulnerabilities associated with the apps, servers, and machines that process or store that data. You’ll also need to demonstrate that you can respond to any threats as they emerge. Providing this level of insight for Azure workloads requires that you can discover new instances, validate machine configurations, monitor logs, run vulnerability scans, and respond to emerging threats. And bring all of that data together in a meaningful way so that you can run comprehensive compliance reports as well as maintain a secure posture in this dynamic environment. AlienVault USM Anywhere delivers just what you need to be compliance-ready, saving you time and money while benefiting from the speed and agility of the cloud. You can deploy USM Anywhere within minutes, and have rich, customizable views of your security data to provide to your auditor when you need it. Most companies have hybrid environments, where some data and apps have migrated to Azure, and others remain on-premises. In this scenario, it’s essential to have a complete picture into the security posture of this data, such as its host machine configurations, user access and activity, system vulnerabilities, so that you can detect and stop any advanced threats to that data. But if you’re managing two separate security monitoring infrastructures - one for on-premises systems and another for Azure - you’re working twice as hard and still missing the big picture. USM Anywhere overcomes this challenge, by unifying security monitoring across environments - whether you’re using Azure, AWS, or both. Plus, as a cloud-based security management solution, you can scale your threat detection and response capabilities as your hybrid environment changes, and pay for only what you need, when you need it. 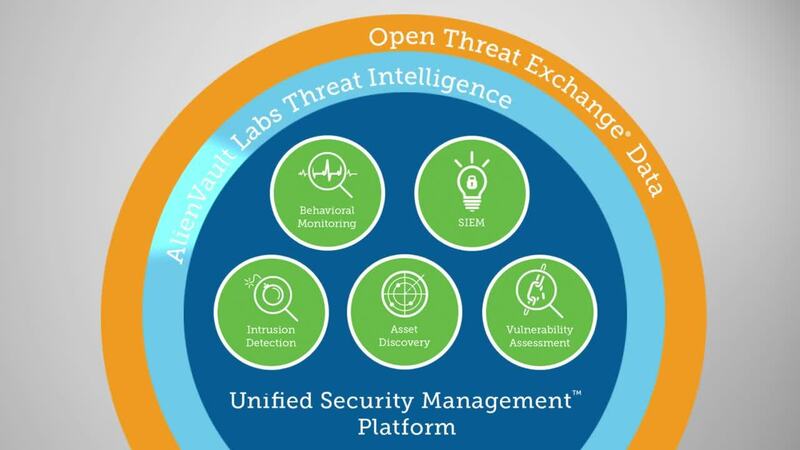 By unifying security monitoring, USM Anywhere delivers simplified and scalable security and compliance.